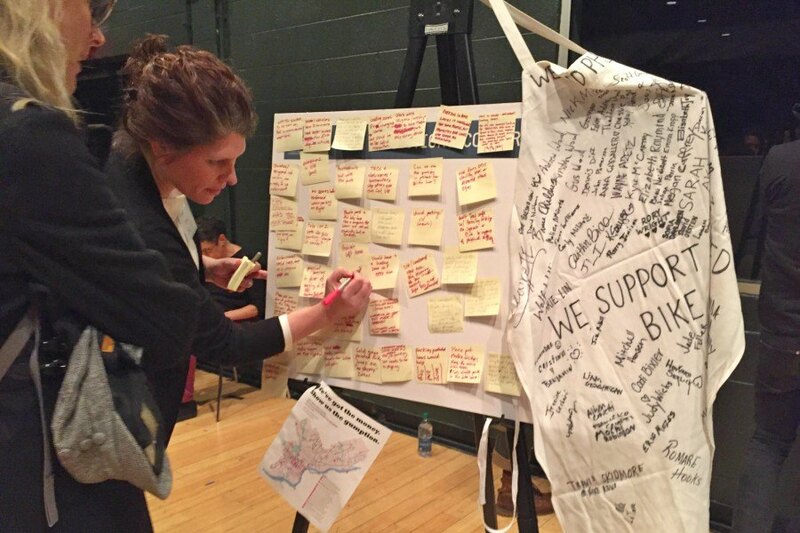 A woman notes her concerns at a meeting to discuss the bike lanes swap on Wednesday evening at the Kimmel Center. It’s a smart move, but not smart enough. That’s what bike advocates have to say about the city’s plan to swap the bike lanes on Spruce and Pine streets — the most-traveled in the city, according to the Bicycle Coalition of Greater Philadelphia — from the right side to the left side of the streets. The bike lanes are among the most controversial (if not the most controversial) in the city, largely because cyclists have pushed for protection along the lanes — meaning something to divide bikes and cars — for years. Their effort was renewed after 24-year-old Emily Fredricks was struck and killed in December by a trash truck on 11th and Spruce streets in what cyclists call a “right-hook” incident (which occurs when a car turns right into a biker’s path). Rather than protecting the bike lanes as cycling advocates have suggested, the city has proposed swapping them to the left side of the street. Officials with the city’s Office of Transportation and Infrastructure Systems presented plans for the switch at two different community meetings this week, on Wednesday and Thursday evenings. They say the move would effectively reduce the risk of right-hook crashes (which are four times more common than left-hook crashes, per the Bicycle Coalition). Cycling advocates agree. Plus, they say, left-side bike lanes can reduce conflicts with buses, which primarily use the right side of the road, and increase the visibility of cyclists. 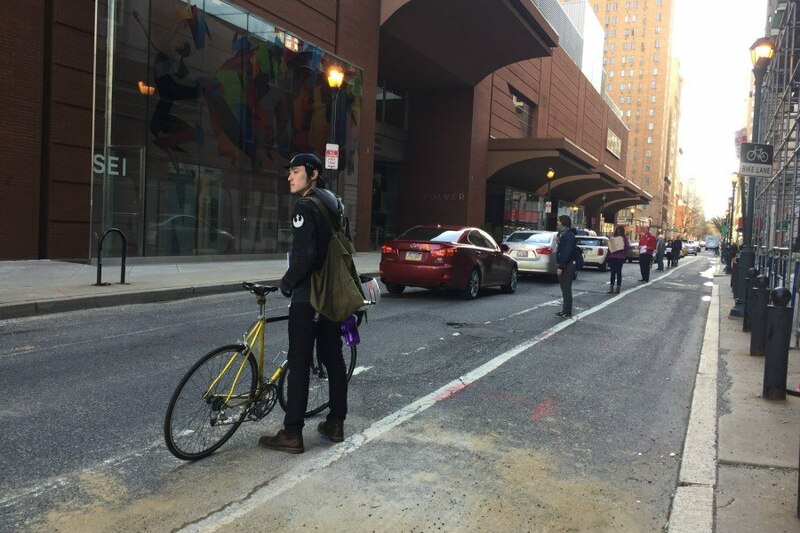 Gitto and several other cyclists lined up along the Spruce Street bike lane near the Kimmel Center just before the city’s meeting on the proposed swap was set to begin inside the building on Wednesday. They formed a human wall to prevent cars and delivery trucks from double-parking in the bike lanes, a dangerous and common issue on Spruce and Pine streets. Cyclists line up along Spruce Street to protect the bike lane on Wednesday. OTIS officials have repeatedly stressed that they must meet community concerns regarding bike lanes — which is largely why they held this week’s meetings. Neighbors and businesses along Spruce and Pine streets worry that adding protected bike lanes could interfere with package deliveries (since trucks often use the bike lanes to unload). 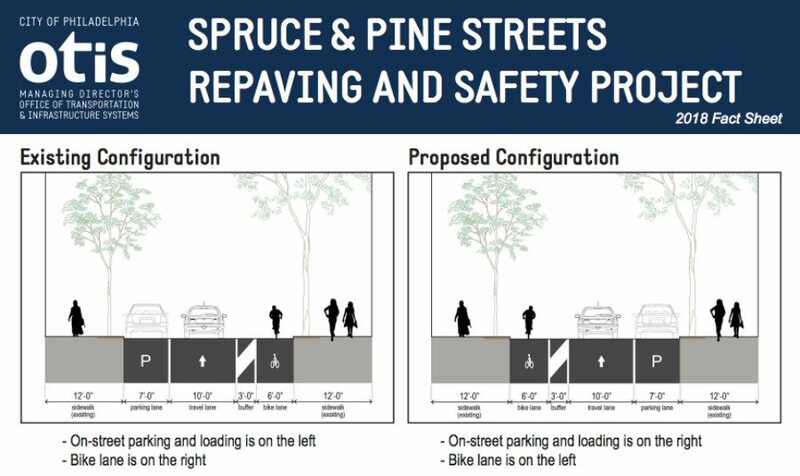 Officials say they are strongly considering the needs of neighbors and delivery vehicles: They’ve proposed adding specific dropoff spots along Spruce and Pine to better separate trucks, bikes and cars. The meetings this week did not follow a town-hall style. Instead, the plans were presented on detailed boards that stretched around the room, and community members had the opportunity to engage with roughly a dozen city employees and leave comments. Mike Carroll, the deputy managing director of oTIS, said the goal of the meetings was to foster “extended dialogue” rather than the “fair amount of grandstanding” that can accompany town-hall events. The meeting at the Kimmel Center on Wednesday. “There’s a lot of benefit to be had by moving forward with this concept,” Carroll said. When asked if the city was still considering adding protected bike lanes to Spruce and Pine, Carroll said “it’s fair to say they’re in the discussion,” but that the organization hasn’t yet seen “enough consensus.” He stressed that oTIS is working to develop a network of protected bike lanes else throughout the city (like on the high-risk Market Street and John F. Kennedy Boulevard), including on less “controversial” roads. “Then when we come back to certain neighborhoods — that opens up the next stage with the public,” he said. Other changes coming to Spruce and Pine streets include new striping in intersections to better inform drivers of bikers’ paths, as well as potential protected intersections. For now, the city must secure approval from City Council (including councilmembers Mark Squilla and Kenyatta Johnson, whose districts include the bike lanes) as well as civic organizations like the Center City Residents’ Association and the Society Hill Civic Association. The CCRA, which attended the meetings this week, said they were in the “listening and learning,” stage, according to Maggie Mund, the organization’s streets committee chair. At least one member, Sam Gordon, said he bikes to work and is in favor of the proposal. Loading zones tend to be neighbors’ biggest concerns, he said. The Society Hill City Association, which attended the meeting on Wednesday, said it feels that further study is needed before it takes a stand on the plan. In the meantime, oTIS has been coordinating with SEPTA and the Philadelphia Parking Authority regarding the plans, and the city will likely repave the roads this fall. 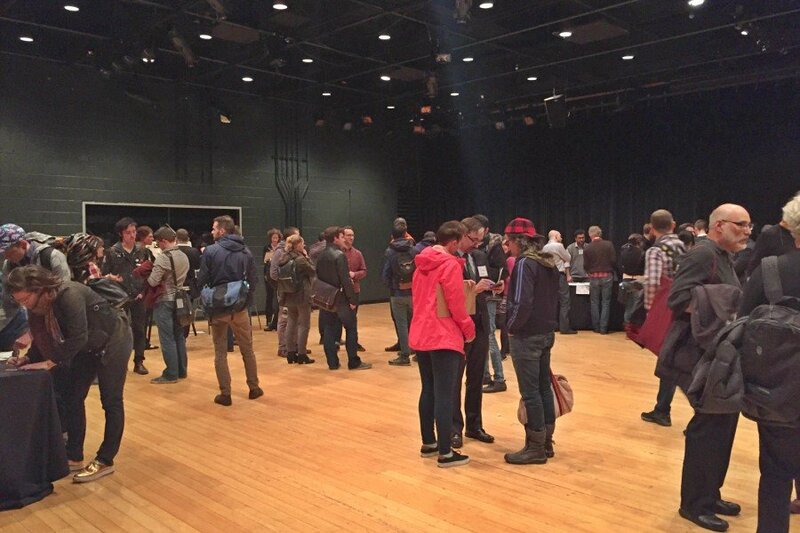 Community outreach will continue in the months to come.